Feds Back Money Markets: Is Your Fund Safe? 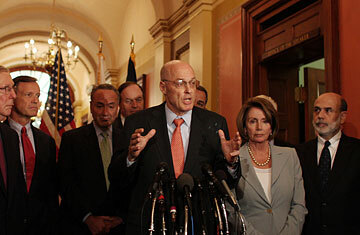 Treasury Secretary Henry Paulson after meeting with Congressional leaders on the economic crisis Thursday, Sept. 18, 2008 on Capitol Hill in D.C. If you're invested in a money market mutual fund and have been reading the scary headlines, before you do anything else do this: nothing. Yes, on Sept. 16 a money fund marked its net asset value below $1  sacrilege for an investment meant to be the same as cash. After the Reserve Primary Fund "broke the buck" because of debt it held that was issued by the now-bust investment bank Lehman Brothers, institutional investors scrambled to withdraw their money. Sept. 18 brought additional worries: Putnam Investments said it would be shutting down one of its money market funds, and the ratings agency Moody's warned it might downgrade 13 of Lehman's funds. (Lehman's asset management subsidiary was not part of the bankruptcy; it continues to operate normally.) Other asset managers tripped over themselves to proclaim their funds safe, going as far as to say they'd start publishing their holdings online daily to prove they don't own a lick of dubious debt issued by other embattled financial firms. And then, on Sept. 19, the Treasury Department announced a $50 billion program to insure the holdings of any money market mutual fund  retail or institutional  that pays a fee to join the new program. But let's go back to be beginning, to being a do-nothing. At this point, there is a greater risk from mass redemptions  like a run on the bank  than there is from a rash of money funds declaring that their assets have gone bad. Money market funds are designed to be low risk, and by law are allowed to invest only in government bonds, certificates of deposit, short-term IOUs issued by companies, and other highly liquid securities  though, unlike the similarly named "money market deposit accounts" found at many banks, they're not FDIC-insured. The problem with the Putnam fund, which was sold only to institutional investors (such as pensions funds and insurance companies), wasn't that it was losing value but rather that so much money was being withdrawn. The fund was going to be forced to dump a big block of its holdings, and flooding the market like that has the effect of driving down security prices  thereby driving down the value of the fund you want to keep at $1 per share. "The investors are almost as important as the investments here," says Peter Crane, money fund expert and CEO of Crane Data. "A full-blown run would be perilous." That's why the Treasury stepped in with its guarantee program  to help prop up the price of any money market that needs it, and prevent investor confidence from being undermined. So far, there hasn't been anything resembling a full-blown run. A lot of money flowed out of money funds for the week ending Sept. 18, but most of the redemptions were among institutional investors, says Crane. The person who can prevent it from spreading to retail investors: you. So now let's talk about Reserve Primary Fund, which was the first of three funds at Reserve Management to break the buck. What Reserve announced was that because of investments in Lehman IOUs, it was worth 97 cents per share instead of a dollar. In other words, it was down by 3%. Not worthless. Down by 3%. Let's keep that in mind. Let's also keep in mind that if Reserve Management were a big, multi-faceted money manager instead of a focused, privately held company, there's a good chance it would have averted having to mark down its fund. We can say that because that's what big, multi-faceted money managers have been doing. According to Crane Data, over the past 13 months, 21 money market funds have received capital infusions from their parent companies in order to avoid breaking the buck. Parent companies can go as far as actually handing the funds cash and take the troubled assets onto their own books. The early problems were tied to commercial paper issued by mortgage-related structured investment vehicles and collateralized debt obligations (don't worry: there won't be a quiz on the terminology), but more recently four funds (at least so far) have propped up their money markets because of investments in Lehman. Companies don't routinely have to back up their money market funds this way, but they do from time to time. In 1994, for example, amid the bankruptcy of Orange County, Calif., more than 20 money market funds were bailed out by their corporate parents. Only one fund was liquidated. And even then, investors received 96 cents on the dollar. The reason Moody's is considering downgrading 13 of Lehman's money markets isn't because of what they own, but because the ratings agency isn't sure the parent company, which is in bankruptcy, would be able to step in if needed. So what should you do now? Nothing, right? Okay, maybe there are a few small things. For starters, look at the yield on your money market fund and compare it to the sector. Naturally, you want the highest return on your money. Except that maybe you don't. Higher yields usually mean riskier investments  more commercial paper, say, as opposed to Treasuries. Last Friday, before the Lehman implosion, Reserve Primary Fund was the second highest-yielding fund of the 100 largest tracked by Crane Data. For months before that, it was in the No. 1 slot. "You want to act like the smart caribous and stand in the middle of the pack," says Crane. And, of course, make sure your fund is at a big firm that has the wherewithal to back it up, should it come to that. Will more companies have to step in and prop up the value of their money market funds? Probably. Will more funds break the buck? Maybe. But short of having all your money in FDIC-insured bank accounts, which most likely carry lower yields, there aren't that many options that are safer.